Mosaic Backsplash Tiles - Set of 6 from Collections Etc. These easy-to-apply backsplash tiles will instantly give your kitchen or bathroom a stylish update. 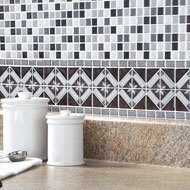 Each set includes six 10-inch squares of mosaic-style tiles that can be cut to fit your space. The tiles adhere easily to a clean wall surface. Easy to wipe clean. Instructions included. Epoxy and plastic. Each sheet is 10"Sq. Available in Brown Multi, Blue Multi, Black and White, Blue-Green, Solid Black or Solid White. Should not be used around high heat. Indoor use only. This is my fourth purchase! LOVE the difference these have made! - Bridget, Pittsburgh, PA. These mosaic mock tile sheets work perfectly and very quickly. The onsite carpenter did not finish my tile work in my kitchen so I used this product and it worked perfectly, matched nicely and completed a project in a matter of minutes. The tiles are raised which makes it look more realistic. Over-lapping technique keeps the tile sheets in place. Easy to cut to size and sticky is just that. I could go nuts with this stuff! - Rainy D., Camas, WA. So easy, I did it myself in a half hour. Just told my sisters about this product. It's easy and looks great!! I'm buying lots more of these! I would buy this poduct again! Perfect to update my old bathroom tiles! Great way to spruce up my kitchen. they are so easy to use and look great . Easy Application and Looks Great! I would definately recommend this product. Love these peel and stick tiles they are easy to apply because they are not stiff and go on easy will get more in a different color for my kitchen . - Ronnie, Middle River Md. I highly recommend this tile to every one. Worked great for my Kitchen! Don't need more than these! I would buy again if I needed more. - peanuckle, Kane, Pa.
Good price - forrest,s dad, Parrish, Fl. Great price and exactly what I wanted. This is what I was looking for. They look great and easy to put up. - RareBlueEyes70, Reidsville, N.C. I wish I had bought this years ago. I will always buy this product. We love this product because it colorful in our kitchen and brightens it up. - Jenny, Orlando FL. Liked so much I ordered more.. So easy to install, even I can do it. I did do it!!! And it is so pretty. - Mom, Minneapolis, Mn. I DID buy this item again..
Love my Mosaic Backsplash Tiles! Hung these curtain panels at my french doors.. Adds color to my living room.. They hang really nice.. I'm very satisfied with this product. 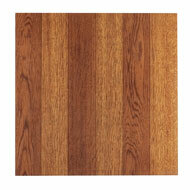 - crabbydot, Gloucester, Va.
My kitchen looks new again !! Fresh look and easy to install. My, and your's best Mosaic backsplash. Easy to use and make. You buy some and try it. - Peggyw, Ga.
Would definitely buy again. Love the look. 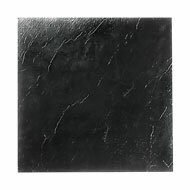 I purchased these tiles for my back-splash in kitchen. I found them easy to peel & stick. Had to measure & cut out for receptacles of course, but turned out very nicely.. A lot easier to wipe off than just my painted walls.. Wish I could have covered wall behind my range, but the tiles are not fire proof.. Al in all, I am satisfied with this product.. - crabbydot, Gloucester, Va.
Good product...i would buy again. This worked perfect over sink in bathroom. This item was a very easy fix to add a pop of color to a drab bathroom. Easy to put up & take down. perfect for the unskilled home improvement type - homebody, Lake Ariel Pa.
Love it... - Paula, White City, 's. I would use again for a small area. I HAVE NO USE FOR THESE.